We get asked fairly often how we make money on the road. And it's a great question. The truth is, many types of jobs don't lend themselves well to traveling full-time. Thankfully without realizing it we started several years ago building an income that was location independent. It was just the first step, though. Read on to find out more. I started a branding and web design company (FortySeven Media) years ago with a partner. What began as a side hustle turned into my full-time job and before I knew it, I was making a decent living working from home. We kept our expenses low, automated as much of the business stuff as we could and built a strong self-sustaining brand. 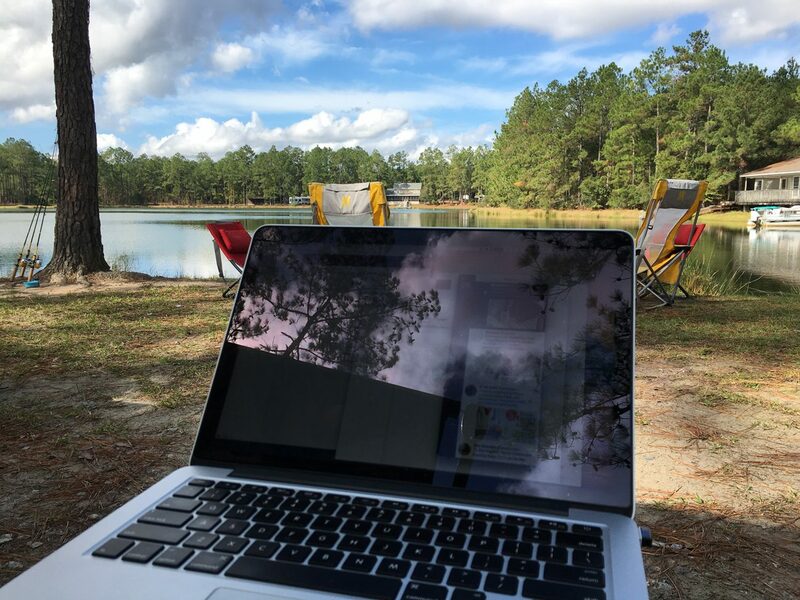 Having my own company that allowed me to work from anywhere (with an internet connection) was a huge blessing and quite honestly one of the most important factors in our decision to travel full-time. I see a lot of people who want to travel, but are trying to make the jump to a completely new location independent occupation at the same time. That's a lot of stress. The transition to traveling can be pretty expensive. Buying a trailer, possibly a tow vehicle, and all manner of specialty products adds up quickly. We had to buy new mattresses and outfit our new truck with a couple of grand worth of a hitch, bike rack and toolbox. Then there are the random emergencies. Like having to replace your transmission unexpectedly - or finding out that your brake controller was bad and ruined the bearings and brakes on your trailer in just one year. There goes another couple grand! Now imagine adjusting to a totally new way of life (some call it getting your road legs) while trying to upend your occupation at the same time. It's possible, but dang. That sounds like a whole lot of stuff to deal with at the same time. There are lots of internet based jobs, and they can be great! But make sure you are established in that job before you sell the house and hit the road. FortySeven Media is our main source of income, but it's not the only way we provide for our family. Last summer we decided to try something new. We looked for a work camping opportunity. Basically this means that you get to stay at a campground for a season for free in exchange for a certain amount of work around the grounds. That can be running the office, doing maintenance work, cleaning the bathroom, or helping build stuff. Some places will pay on top of giving you a campsite to stay at depending on how many hours you're working. It's a great way to slow down, get to know an area really well and save some cash while you're not driving a bunch and paying for campsites. We really enjoyed our time in Oregon even though we were pretty restless by the end of the 4 months we stayed. I don't think we'd want to work camp full-time, but augmented with some other small income you could live pretty cheaply on the road. This blog was started as a way to catalog our journey. To have a way to look back on our adventures and not forget everything we've done together. It never occurred to us that we could use the blog to get in places for free. After meeting a few other traveling families that were doing just that, we decided to give it a shot. I'm sure it helped that I make websites for a living and ours looked pretty decent, but I was surprised how many companies were happy to give us free passes to places in exchange for an honest review on our site. This can be a great way to save money, especially when you have 4 kids. A simple zoo outing can get expensive quick with that many people. While technically this may not be making money it's allowed us to have some amazing experiences that didn't cost us anything out of pocket. Hand in hand with reviews and experiences, we started to see that our website could be used to help sell products and we in turn could get a small percentage of that sale. Personally, I've been reluctant to do this for a while because it can get squirrelly fast, but as long as we make sure we're linking to things we really believe in I think it's a nice way to help others find what they need and get paid for it. The key is to create content that favors both affiliate products you love and regular products you love. If you get too caught up in thinking about how you make money for everything you post then you lose your authenticity. We took it a step further than just putting links into posts and built a curated adventure shop. True to what I said earlier not every product is an affiliate link, but it is an opportunity for us to build an archive of great products for visitors to search through and help us earn some side income. If you have enough traffic affiliate links can be a good way to drum up some spare cash. Lots of traffic can equal a paycheck. If it's not obvious, we try not to put all our eggs in one basket. We're constantly creating, making and learning new skills. Here's a few other things we have done. Consulting sessions for downsizing or storage. You can get in touch for any of those things on our contact page :). So yeah - there you go! This is currently how we make money while traveling full-time. My guess is this won't be the same list in a year. Why? Because lower expenses and more geographies means we get to try out all sorts of work options as we travel. Having a solid base income lets us do that. If you have any questions at all feel free to get ahold of us through the comment section below, contact form or catch us on Facebook or Instagram.